There is no greater teacher than one’s own experience. Especially when it comes to spiritual progress, theoretical knowledge is useful in satisfying the intellect, but lasting transformation cannot happen without one’s direct experience. Experience of Kailash yatra can never be fully explained in words, but this humble attempt will hopefully be used as an inspiration for those who read about it to strive to reach “the crown chakra of Mother Earth” and achieve their own experience of the mighty Kailash one day. The greatest blessing of our colourful group of 84 was that we could experience Kailash in the physical presence of Mohanji. When dealing with matters that are beyond the mind, only those who have mastered the mind can provide precious guidance in the right moment, the moment when transformation either happens or doesn’t. Mohanji has prepared us mentally that journey to Kailash will be tough and a true test of our faith and surrender. He said that during Kailash yatra “Grace is more essential than oxygen.” However, mind could not quite grasp the true meaning of those words until the great teacher Experience appeared. Another crucial question is – am I ready to face the mirror? Before proceeding with my own “mirror facing experience” during the 3 days of trekking, I can’t but mention the most sublime, most unexpected blessings received at the lake Mansarover, the grand cleanser of negativities beyond this lifetime, the lake in which celestial beings bathe every day. I must admit that I was dreading the experience of Mansarover. We were in the Himalayas, in our winter jackets with several layers of clothing below – it’s not all that easy to believe that we can just blissfully enter the ice cold water and take 9 or more dips in it, without any consequences to our health. During the long bus ride on the way to Mansarover, my mind kept bombarding me with the fearful thoughts like “If I get the ovary inflammation due to that ice cold water, the whole yatra is gone for a toss. Is it really worth the risk?” At one point I got tired of these thoughts and decided to share the same with Mohanji. He immediately reassured me that I will be just fine. He said there is no way I could miss this opportunity of a lifetime – the cleansing at Mansarover lake is too powerful, it penetrates and removes the negativities of many lifetimes. When we reached Mansarover, its surreal beauty, its surreal beauty left us in awe. While admiring its azure green shades and divine sparkles of sun reflection on the water I suddenly saw a strong flash coming from the clouds. It was just like somebody flashed with the photo camera a couple of meters away from my face – except that this was coming from the clouds far away. I kept looking intently through the window of our bus but could not see anything after that strong flash. I wondered what that was. A couple of minutes later, Spomenka shared with me the photos she clicked with her mobile and pointed at 2 balls of light that were visible on a dozen of photos, all in different locations (in the clouds, near the Mansarovar water, near one house, etc.) I was totally amazed – this was it! The celestial beings made their presence known to us in the most unexpected way. I was getting more and more excited about our Mansarover dip! When we reached the beach and the bus door opened, my joy was spoiled by many mosquitoes of huge size (at least 3 times bigger than the usual ones) that surrounded us all of a sudden. I kept waving with my hands in distress until one of the tour organizers said with a smile “Nothing to worry, these are vegetarian mosquitoes. They don’t bite.” I was not sure whether he was joking or not, but soon realized that they were indeed not biting us. “Vegetarian mosquitoes” – how amazing was that?! I laughed and said this must be some good karma due to being vegetarian 🙂. The overall feel on the beach was surprisingly great. The weather was perfect (22ºC), totally sunny and pleasant, and all of us rushed to remove the clothes and enter the water. I soon came to notice that most people had their bikinis or whatever was the choice of clothing on them already, so they were ready for the dip in no time. I was yet to change my clothes and had to wait for one of the two small tents allocated for the ladies, which took time. Kailash was not visible at first from the clouds and then, as if in Divine theatre, we saw only the base of it getting revealed beneath the white clouds, with unmistakable small ‘m’ clearly written all over it. What a beautiful welcome for Mohanji and all of us! After some time, the clouds parted and our joy knew no bounds as we beheld both, Mansarovar and Kailash with our physical eyes. I finally got to change my clothes, took a deep breath and entered Mansarover – the cold water was strangely energizing and the feeling of diving into it and then looking at Kailash between each dip was truly grand. After doing 9 dips and enjoying the view of Kailash some more, I had the desire to perform Abhishek of Mohanji with Mansarovar water. I looked to my left and saw him turning towards the shore at that same moment. Since he entered the water much before me, he was just about to leave. I ran in his direction and shouted: “Wait for me, wait for me!” Sumit and Spomenka also shouted, “Biba is coming!” Some strange excitement overwhelmed me and my heart was beating like crazy! 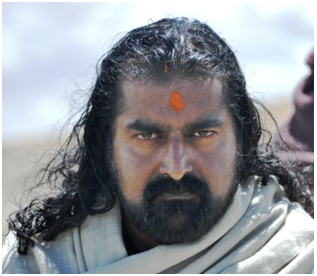 I briefly saw Mohanji’s eyes and understood immediately that he was in an expanded state – the expression in his almost red eyes was very Shaivic, very powerful. My heart melted as I did the abhishek and then suddenly ‘bam!’ – a totally unexpected blow which almost knocked me off. Mohanji poured water on my head but energetically it felt like a mighty slap, as if the water thundered on me high up from a mountain. I was squatting in the water and barely managed to fold my palms when ‘bam!’- another ‘hit’ came, so strong that it felt like it literally peeled a layer from my body/system. There was no time to think, pray, breathe, or even remotely try to understand what was happening. With eyes full of water and tears, I looked at Kailash in the distance, and then ‘bam!’, another hit and another layer peeled off. I cried and laughed at the same time, in total delirium, in total gratitude. The next thing I recall is Mohanji leaving the lake supported by Sumit and one more person and me exiting the water as well. After we reached our accommodation next to the lake Mansarover, I came to know that Sumit clicked a couple of photos with his mobile while I was undergoing this experience. My heart skipped a beat when I browsed through the photos and noticed Shiva’s third eye on my forehead as if deeply engraved. I just kept looking at it, totally speechless… Om Namah Shivaaye! The next day we saw something even more amusing – Mohanji’s face (semi profile) on Mount Kailash, but this time with sunglasses and a white cap which he wore many times during the yatra. I started the 3 days of trekking (the actual Kailash yatra) in the height of restlessness. I was told that morning that weather could be very cold and thus added many layers of clothing onto my body. However, by the time we were to start the trek, the sun was blazing and I start sweating a lot while waiting for the allocation of ponies and porters to be over. I was given a piece of paper with the name of the owner of the pony and was told to make sure I don’t lose it. Before I knew it, Mohanji and the rest of our team started walking and I was still not able to identify the pony allocated to me (which I intended to use only in case I fall sick/weak and cannot continue the yatra on foot). I requested some of the Tibetan porters to read out to me the name written on this piece of paper, but none of them could read the handwriting with which it was written – I was stuck! Sumit told me not to worry –the man who owns the pony will surely search for me as this is their livelihood. I thus started walking, even though I felt quite unsettled. Under the scorching sun I soon removed my heavy jacket and tied it around my waist. Then I removed my winter scarf and tied it around my waist. The next was my black sweater – it too found its place around my waist. I felt so heavy with all this clothing hanging from my waist, plus the two walking sticks that I didn’t feel like using, water bottle, snacks – it all felt like a lot of luggage as the lack of oxygen started to make me feel increasingly weak. On top of it all, this inexplicable frustration and restlessness kept building within me – in fact, I never felt this restless in my whole life! I pretty much felt like a helpless child lost in a crowded market place. Other yatris kept passing me by, either on ponies or by foot, and I felt that I was the slowest and most miserable of them all. I could not recognize myself – I have faced far greater challenges in my life, but my inner state was never this bad. Then one of our sweet yatris Akshay came with a big umbrella and offered me most lovingly to share its blessed shade with him. That felt so great and I was very grateful. My morale was boosted a bit and soon everything seemed to be falling into place – the owner of the pony appeared and I was able to offload on him my heavy jacket and whatever else I could. That was such a relief! It was as if I had to be reminded of how important it is to “Travel light through life, drop the unnecessary luggage”. Still, I was feeling quite breathless and clearly lacked the stamina. This took me by surprise. I was quite happy that from the beginning of the trip my body was coping with the hypoxia (high altitude sickness) so well while many of our yatris were vomiting and falling sick. Another instance of sumptuous feeding of the ego, coupled with the wrong assumption that the same trend would continue till the end of the yatra. The straight path slowly turned into our first bigger hill. Due to hypoxia, what would have been a normal climb in the usual conditions, became a great struggle for breath after every couple of steps. I tried all the breathing and concentration techniques known to me but still could not keep the pace without stopping to catch the breath. My confidence was shattered and I felt totally miserable. After somehow climbing the first hill I had to admit to myself that I could no longer cope. With a heavy heart, I decided to use a pony. At that point, hypoxia already overwhelmed my system and the very act of climbing onto a pony made me gasp for breath. The scenery around me was stunning, but I could not enjoy any of it as all my energy was spent on maintaining the balance on the pony and ensuring I take a sip of water frequently enough to avoid dehydration that makes hypoxia even worse. By the time we reached our destination, Derapuk camp, with the stunning view of the North Face of Kailash, I could not wait to crash into a bed. It was freezing cold, there were no toilet facilities, mud, chaos, noise – difficult to say what was worse, my inner state or my surrounding… It was ironic – the mighty Kailash that I dreamed of seeing for years was now right before my eyes, but I could not bring myself to even utter a prayer – I was just so miserable at all levels – physical, emotional, mental and spiritual, as disconnected as I could be from my Higher Self, Mohanji, Kailash, Divine…. I felt like finding a hole and hiding in it… When I entered the room in which Mohanji was seated with several other yatris, I witnessed with a blank expression on my face how they were overflowing with devotion, gratitude and joy, laughing and sharing beautiful experiences, massaging his feet, soaking in love – Dhriti managed to walk to the point at which one could touch Kailash and came back with a big radiant smile. Others shared their own experiences… That made me even more miserable – I had nothing, absolutely nothing to share, zero ‘bhaav’ (feeling/ flavour of genuine devotion), and I would never try to fake it. I felt totally numb, disconnected and miserable. At one point Mohanji looked me straight in the eyes and said “You are in the illusion of doership, that is why you are going through this. You think you can do the yatra relying on your physical strength and stamina, that you are the doer. When you lose the bhaav, you lose the grace – simple.” This comment crushed the last inner wall that kept me composed – I knew that what Mohanji said was absolutely true and admitted to myself that I totally lacked surrender. I could not understand how this could happen to me though. I waited and prayed for years to come to Kailash and now that I reached I felt nothing! I was agonized. To a person on a spiritual path, there is no greater pain than spiritual numbness, the feeling of being disconnected from one’s Guru/Higher Self/Divine. After Mohanji uttered those words so bluntly, I had to agree – it was not about the hypoxia, the pony that was not to be found, or any other silly reason. This was all about me and my ‘doership’, my lack of surrender, while Kailash was right in front of my face! I had a bit of a warm herbal tea and disappeared into my room eager to sleep and rest from this agonizing turmoil, hoping that somehow sleep would make it all better. The Many Faces of Moahnji. As our spiritual master, we need to emulate Mohanji in every way. We see him smiling, laughing, in deep concentration, playing cricket, engaging in deep meditation and doing the mundane activities of life. During all of these times, irrespective of the activity that he is doing, he is always calm. I remember times when Gurudeva was here in South Africa and I was panicking because we were late or if something was not working out and in all of this Mohanji was always calm. While I was rushing and driving somewhere, Mohanji was calmly staring out of the car window. While I was panicking that someone late, Mohanji was sitting in the lounge with his eyes closed, patiently waiting. Now that I reminisce about these moments, I wonder what was going on in Mohanji’s mind at those moments that allowed him to be so calm amidst the busy environment. Mohanji has never preached that one must give up living in the world and retire to a forest and live your days under a tree. In fact, he teaches the opposite. He asks you to live in the world, work, earn a living, interact with all those around you, but in spite of all these activities, your inner space should be calm and clean. You inner space should be bursting with spiritual light, so much so, that even in the busiest of markets, you are still. I see this in Mohanji. Even at the busiest of times, he eyes reflect only calmness. How does he do this? What is his mind thinking about all the time, so that, even while amidst a huge crowd of people pushing and screaming while walking to the riverbank to do prayers, Mohanji is so calm? Is he occupying his mind with a secret mantra? 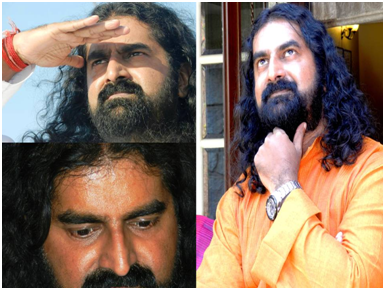 He is continuously using his mind to visualise Lord Shiva or some calming image like mountains or a lake? Is he continuously thinking about his mission and the seva foundation? Understanding this, to me, is a step closer to merging with Gurudeva’s consciousness and reaching the goal of moksha. Who can fathom what the eyes of a Master see? The activity of the mind can be measured with sophisticated equipment available to us in this day and age. But in order to measure this, we need to understand a little about the brain. The brain is made up of millions of connections called neurons. Whenever we do anything, the neurons discharge an electrochemical signal, that activates other neurons and cause them to discharge an electrochemical signal, which in turn causes other neurons to discharge more electrochemical signals. Thus, even the smallest of movements, will cause millions of neurons to synchronously discharge electrochemical signals. The electrical component of these signals can be measured using sensors on the scalp of the head. 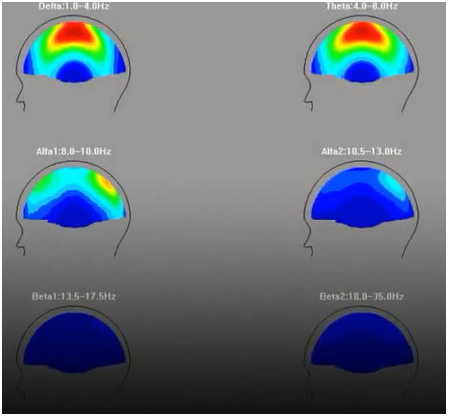 This is called an electroencephalogram or an EEG. So this means that if you blink, millions of neurons produce and electric current or brain wave that can be measured. If you are afraid you produce a brainwave that can be measured. 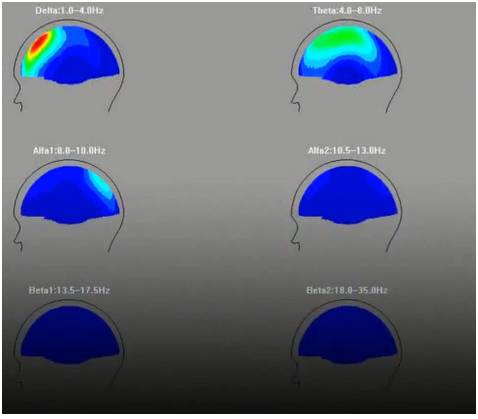 Every thought, every emotion, every activity or movement of the body, will produce a brainwave that can be measured. 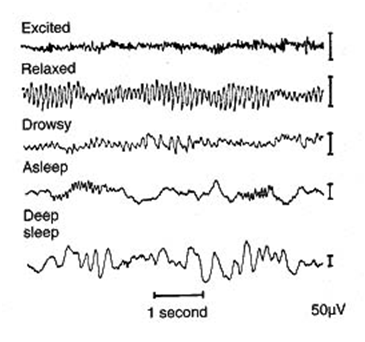 Figure 1: EEG waves shown at different times. There are normally four types of waves that are produced by our mind/brian. These are called Alpha, Beta, Theta, and Delta. Alpha waves are normally produced when you are relaxed and when you are in a state of complete rest. These waves change to Beta waves when you engage in an activity like walking or even thinking ordinary random thoughts as we all do at every second. Most of us are always thinking about something or the other…. What work do we have to do, what we did yesterday, what are the plans for tomorrow etc. Theta waves occur during when you are meditative or when you are between the awake and sleep state. Delta waves only occur during a very deep sleep when you are completely detached from your surroundings. These waves are shown in figure 1. Living in a world that allows access to portable EEG machines is a great blessing. A scientist in Belgrade, Dr Goran R, contacted Mohanji to actually measure his brain wave functions. He came to test Mohanji at a random time, without giving Mohanji any time to prepare in any way. Mohanji did not have any time to do pranayama or meditation. He quickly attached the electrodes of the portable EEG machine onto strategic places on Mohanji’s head. 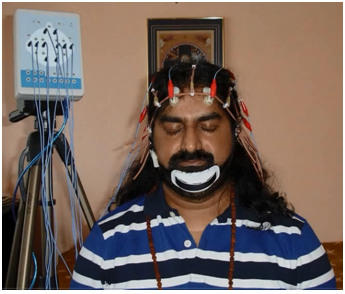 He measured Mohanji’s brainwaves during a completely awake state and during the time he was meditating. The electrode positioning is shown in Figure 2. The results are shown in Figures 3 – 5. Figure 3 shows that there is definitely lots of activity that happens in the third eye region. The closer the activity colour is to red, the more activity is registered by those electrode sensors. The red, yellow, green and cyan colours show lots of activity in the third eye. What is of significant interest is that only the Delta and Theta waves register activity. This is indicative that waves being produced are the ones when you are in a deep meditative state and you are detached from your surroundings. No Beta waves were read. This shows that there are no waves being created by thoughts. This is astounding! This implies that Mohanji has no thoughts the way we do. He does not think about the past or the future, no thinking about who offended him, no regrets… He has no thoughts at all. This was also confirmed in Figure 4. Only waves produced by a meditative state and a detached state were found. No waves from a busy mind were recorded. Figure 5 also produced very surprising results. Hardly any overall activity was recorded in the external electrodes. The only time a reading was measured was during the time of physical movements, like blinking. Again, this is scientific proof that there is no thought activity happening in Mohanji’s mind. This type of activity is only found in deep meditation, indicating that Mohanji is ALWAYS in a deep meditative state. This state of no-mind that is one of the major characteristics of Mohanji has been proven beyond a doubt using technology of today. When Mohanji speaks of moving to a “mindless” state, it is not just theory from the Vedas. It comes from direct experience. So how does Mohanji operate? He operates purely from his consciousness. He works from that formless bliss state that we call God. He always tells us “in the depth of silence you can hear the voice of God”. Yantra representing the Holy Mother. Merudanda Ashram celebrated Navarathri 2014 with love, joy, playfulness and lots of dedication to the Holy Mother and our loving GuruJi Shree Mohanji. 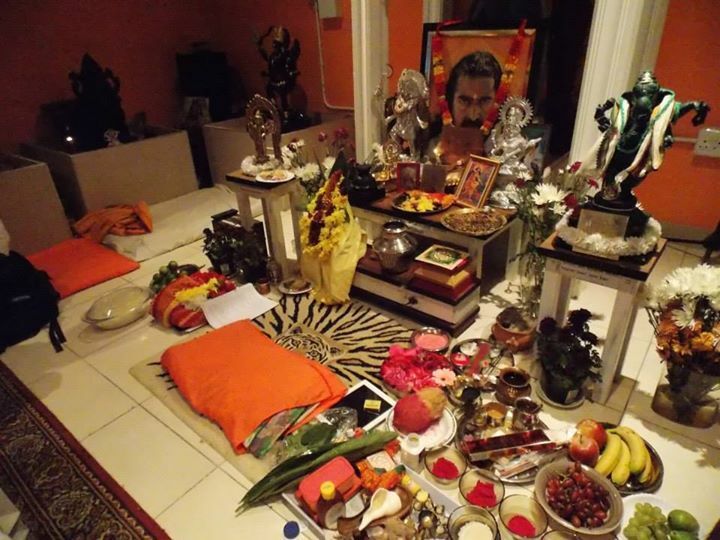 This navarathi had everything; miracles, Mohanji listening to our inner most desires and fulfilling it, feeling the presence of our GuruJi at all times and offering very rare and special pujas (ceremonies or rituals). The festivals kicked off with worshiping Mohanji and invoking our Divine Mother Bagalamukhi. Every day we offered sahasranam (1000 names of the deity) and yantra (geometrical form representing the deity) puja to the Holy Mother. But the highlight must have been the Durga Puja on Sunday. Abhishek and his wife, as well as my parents drove down to Durban that weekend and without knowing about the prayer, were drawn to the temple that weekend. It was a lot of hard work preparing all the items for the puja, and I’m sure many people got tired with how meticulously I like everything to be prepared. A puja is not just sitting there when the mantras are being said. A puja is getting everything ready the day before, cleaning the temple, cooking parsad (food offered to deity, Guru or God, before being consumed) cleaning yourself before you pray, dressing up… Everything… It is a mindset that you cultivate during that time. Everything was checked and double checked the night before. Garlands for the deities were made and tried on so that they fit perfectly. All that we can do must be done, and the rest is left up to the divine. The puja started with offerings to the principle deity of the temple, our Guru Mohanji. We then invoked Mother Lalita Tripurasundari into a kalsa (water pot covered with coconut and worshiped as the deity) and began worshiping her. There was such a divine feeling in the air. Peace and love seemed to fill every cell of our bodies. 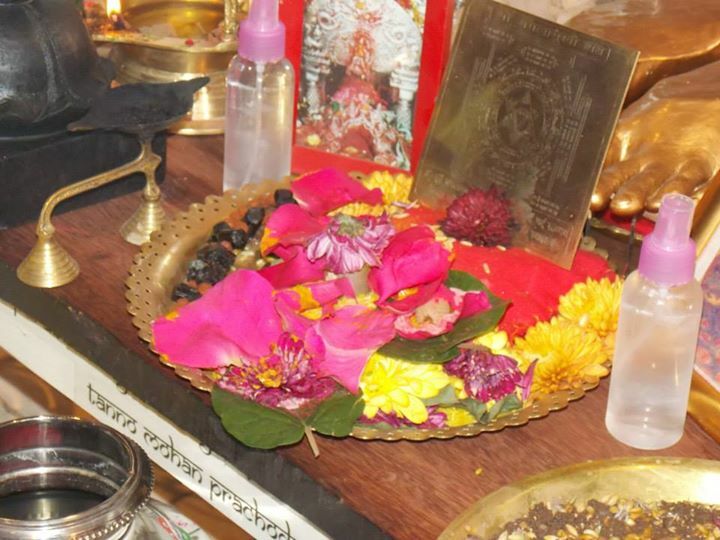 The energy flowed form Mohanji and during the puja many people felt as if Mohanji was walking around and giving everyone shaktipat (energy transfer from the Guru bestowing immense blessing and evolution). Eventually the time came to offer her a fresh garland of flowers and a garland make out of lime and rudraksha (dried seed of a specific tree which has special significance on the path of Shiva). I happily offered the red, yellow and white garland that we made the night before. To my surprise the garland was small!!!!!! How could this happen? The night before, in front of everyone sitting at the dining room table, I measured the garland against the coconut and it fitted perfectly. It covered the top of the coconut to a good few inches below the coconut. And now it was not even fitting comfortably around the coconut. Did I make a mistake? I then offered the lime garland which was supposed to be very big and was supposed to cover the entire kalsa. That too was small!!! What was going on!!! I looked carefully at the kalsa, and then it dawned on me. As I looked at the coconut I realised that the coconut had grown. 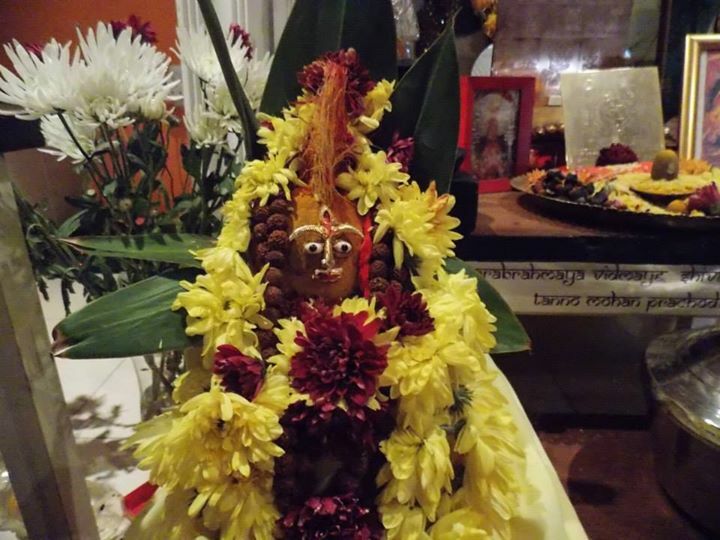 As we did the pranapratishta (imbuing of energy and consecration) of the Kalsa the coconut representing Devi, it grew and that is why both the garlands that we measured the night before did not fit. During this puja every family that attended got the opportunity to do a full Shreechakra Navavarana Pooja as per the Khadgamala vidhi. This is a very sacred secret prayer and everyone enjoyed it so much. 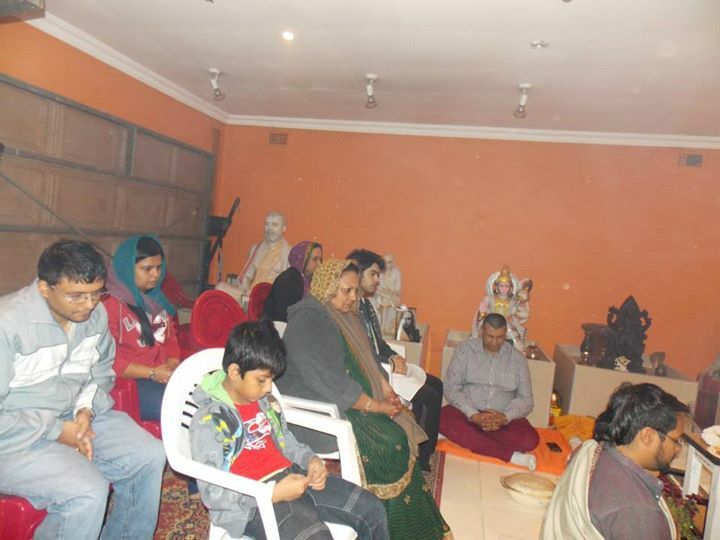 There was so much of joy and happiness and this puja immediately brought prosperity to the lives of some devotees. Some devotees reported that their family circumstances improved the next day, some devotees business challenges were solved etc. Some attendees and families who joined in the celebration. During this puja, we also hoisted the flag for the Merudanda Ashram temple. This is the very first time, that I am aware of, that a flag make from rudrakshas were offered. Certainly this is the first in Africa, if not the world. The flag was not completed totally, but we did not want to lose out on this precious time. The flag has three stages representing past, present and future and well as the three gunas (three qualities or constituent energies of existence). 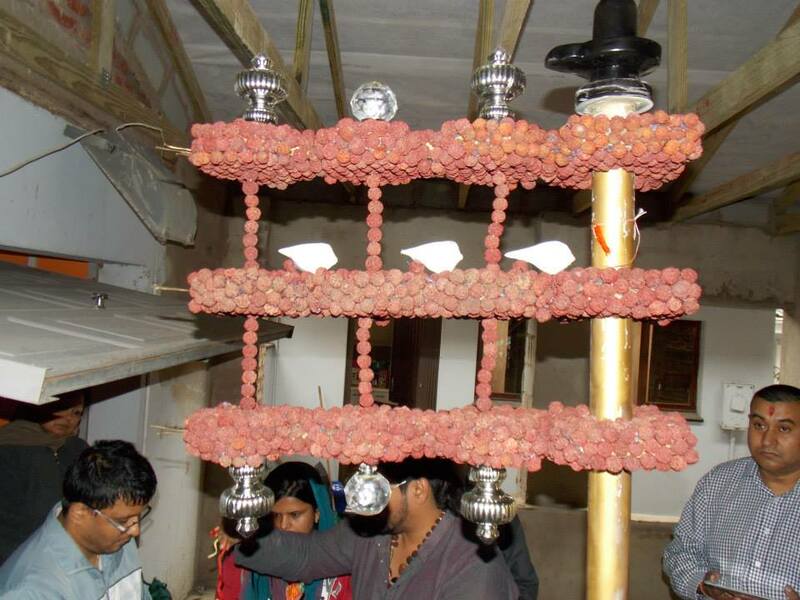 So far, 2160 rudrakshas were used to make the jhanda (flag), but more will used to finish it up. The flag consists of six domes, and three conch shells (six more will be added). It stands right in front of the temple and asks as a reminded to centre yourself on your spine. The making of the flag and the emotions that went with it, is a subject of another blog. But I would like to mention that at a time when we felt it might not work out, Mohanji showed his presences and gave a blessing. An Aum sign materialised in water. The janda or flag made of rudraksha beads. The first of its kind in Africa. Mohanji listens to every prayer of yours, whether you verbalise it or not. Twice he did this for me this Navarathri. The first dealt with a murthi (statue) of Mother Saraswathi. I wanted to get a murthi of Mother Sarashwathi that was silver so that it matched the one we have of Mother Kali. The one currently in the temple is very small and old. But it was too expensive for me to afford. Many times I saw the murthis at a prayer shop and each time I sadly put it down after looking at the price tag. This Navarathri I just surrendered it to Mohanji. While walking in the same prayer shop I had been to many many many times, I was talking to him. I said that I would like a Mother Saraswathi for the Ashram this navarathiri but I can only spend a certain amount of money. I told him that I can only tell him what I would like, and that he knows best. I reluctantly went passed where the murthis are kept, and suddenly my eyes spotted the Mother Saraswathi that I always liked. BUT, this time there was a mistake on ONE of the murthis. It was marked down to less than half the price. EXACTLY the amount I had said I have to spend on the deity. Even the staff at the shop were supprised. They double checked the price bar-code, and it went through the till. We all looked at each other and I had a broad smile, knowing that this “mistake” was the doing of Mohanji. 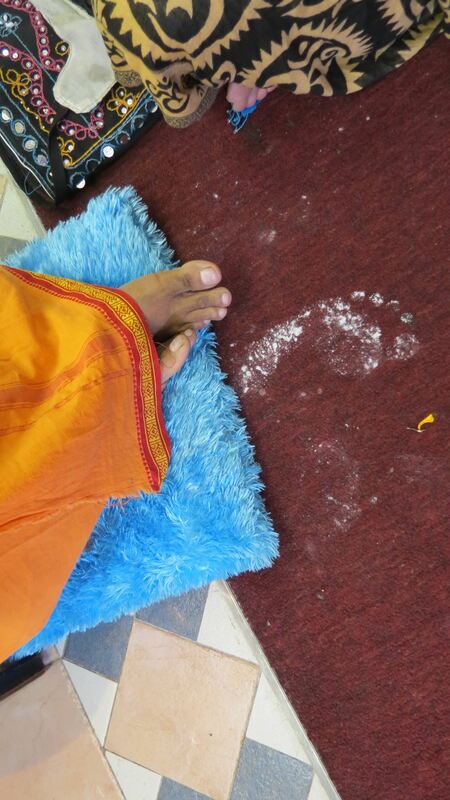 Divine feet of Rajyogi Mohanji. The second wish I had was to get a small granite janda that I have seen is so many temples in Durban. It’s a smaller version of the janda that is usually kept between the flag and the main deity. I knew I could not order one from india because the Murthis we ordered were already on their way, and it would be too expensive to ship it alone. I admit I was sad and I felt disappointed that I let Mohanji down and I should have been more aware. A few days later I get a call from one whom I lovingly call “Uncle Yogi” and he told me that one deity we had ordered from India is here. Of course I rushed over and picked the deity up and I see this small janda in the box!!! It must of course be my friends’ who had also sent some things down. I felt even more disappoint in myself. But after speaking to him, he said that it was not his!!!! The person that carved the murthi added it to the box!!!! Can you believe it!! Mohanji does it again. He inspired the carver to give it to us for free and he did not even tell us that he added this to the box. I was so happy. My Joy knew no bounds. This are some of the experiences we had during Navarathri 2014. I hope you enjoyed the writeup and that you will join us at Merudanda Ashram for the other functions planned for this year.